American scientists inspected the gastrointestinal tracts of 385 gooseneck barnacles collected from the garbage patch, aka the North Paciﬁc Subtropical Gyre, and found microplastic in a third of them. Some specimens had a single piece of plastic in their stomach, while others had gobbled down as many as 30. Results of this research were published Tuesday in the journal PeerJ. [E]ventually I found myself in the lab dissecting barnacles in order to identify them. As I sat there, I thought “Well, I’m working on these barnacles anyway — wonder what they’re eating?” So I pulled out the intestine of the barnacle I was working on, cut it open, and a bright blue piece of plastic popped out. I reached into my jar o’ dead barnacles and dissected a few more, and found plastic in their guts as well. Thinking about it logically, it makes a lot of sense that gooseneck barnacles are eating plastic. They are really hardy, able to live on nearly any floating surface from buoys to turtles, so they’re very common in the high-plastic areas of the gyre. They live right at the surface, where tiny pieces of buoyant plastic float. And they’re extremely non-picky eaters that will shove anything they can grab into their mouth. Gooseneck barnacles look freaky when they come out of their shells. The barnacles are eaten by crabs, nudibranchs, and other marine creatures that are hunted, in turn, by birds, fish, and dolphins. Such plastic is known to block the digestive systems of these larger creatures, wreak havoc with their hormone levels, and damage their reproductive organs. 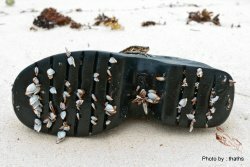 As Goldstein says, it shouldn’t come as a huge surprise to learn that barnacles are eating the ubiquitous plastic waste. One 2006 study estimated that at least 267 sea-faring species had been found to have ingested such trash.